In 2007, a renowned international team of astronomers may have set a new record in discovering what is the most distant known galaxy in the universe. Located an estimated 13 billion light-years away, the object is being viewed at a time only 750 million years after the big bang, when the universe was barely 5 percent of its current age. "We are looking at the first evidence of our ancestors on the evolutionary tree of the entire universe," said Dr. Frederic Chaffee, director of the W. M. Keck Observatory, home to the twin 10-meter Keck telescopes that confirmed the discovery. "Telescopes are virtual time machines, allowing our astronomers to look back to the early history of the cosmos, and these marvelous observations are of the earliest time yet." s we mentioned above in "Galaxy Zoo" post, there are some 100 billion galaxies in the visible universe believed to be between 10 to 14.5 billion years old. Of the galaxies we see, roughly 70 percent are spiral; the rest are spherical and are known as elliptical galaxies -the largest being giant ellipticals more than 10 times as massive as the Milky Way. Black holes ranging from 100,000 to more than a billion solar masses are believed to be at the center of many galaxies. 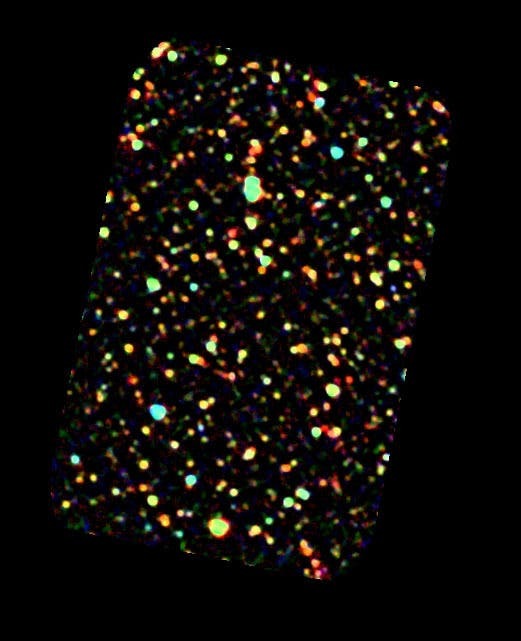 The primeval galaxy was identified by combining the power of NASA's Hubble Space Telescope and CARA's W. M. Keck Telescopes on Mauna Kea in Hawaii, with a boost from the added magnification of a natural "cosmic gravitational lens" in space that further amplifies the brightness of the distant object. The newly discovered galaxy is likely to be a young galaxy shining during the end of the so-called "Dark Ages" — the period in cosmic history which ended with the first galaxies and quasars transforming opaque, molecular hydrogen into the transparent, ionized universe we see today. Professor Richard Ellis, Steele Professor of Astronomy at Caltech, has led a team to discover a population of distant galaxies, existing at approximately 500 million years after the universe was born. It has taken 13 thousand million years for the light to reach us; and we only know about it thanks to some fancy work by the team. When light from those far flung stars pass through a gravitational field of close by massive objects, that light bends, creating the effect known as ‘gravitational lensing’. In what is being described as ‘pioneering technology’, the Caltech led group managed to use massive clusters of galaxies to locate progressively distant systems that would not have been detected using the stereotypical survey approach. Richard Ellis explains the approach, "Gravitational lensing is the magnification of distant sources by foreground structures. By looking through carefully-selected clusters, we have located 6 star forming galaxies seen at unprecedented distances, corresponding to a time when the Universe was only 500 million years old, or less than 4% of its present age." Their initial discovery took place over five years ago, and since then it is unsurprising that there have been some skeptics wanting to see further proof that the systems viewed by the Keck II located on Mauna Kea, Hawaii, are actually as old as they believe them to be. But there is further evidence, which helps support the theory, from measurements taken by the Spitzer Space Telescope. The image at the top of page: ESA's Herschel space telescope discovered that previously unseen distant galaxies are responsible for a cosmic fog of infrared radiation. The galaxies are some of the faintest and furthest objects seen by Herschel, and open a new window on the birth of stars in the early universe. To date, it is the most sensitive image of the universe taken with Herschel.